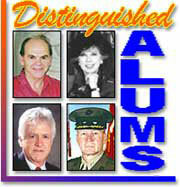 Sam Houston State University has selected four graduates as Distinguished Alumni for 1998. David Adickes, Tommy R. Austin, Karey Bresenhan, and Maj. Gen. Claude Reinke will be honored during homecoming activities at a reception and dinner beginning at 6:30 p.m. Oct. 30, in the Lowman Student Center Ballroom. Tickets are $30. For details, contact the Office of Alumni Relations at (409) 294-1841. David Adickes is a talented artist who has never forgotten his roots. Adickes was born and educated in Huntsville and it is the city he chose for his best-known work--the 67-foot Sam Houston statue A Tribute to Courage, the world's tallest statue of an American hero. Adickes is an artist who didn't study art--at least at first. After attending Huntsville High School, Adickes received a bachelor of science degree in math and physics from Sam Houston State in 1948. Only then did he turn to art, spending a summer at the Kansas City Art Institute and two years in Paris at the Atelier Fernand Leger. He returned briefly to Houston, in 1951, but was soon off to Paris, Barcelona and Tahiti, painting and exhibiting his works in Houston and other cities. After a two year teaching position in the Art Department at the University of Texas, in 1957 he lived for a year in Japan and traveled extensively for the next 10 years in the Far East, Mid East, Europe, Russia and North Africa. "The world was my studio," he says. Exhibitions during this time included shows in Tokyo, Osaka, New York, Los Angeles, Palm Beach, and St. Paul-de-Vence. In Texas there were exhibitions in Ft. Worth, Dallas, and San Antonio, as well as Houston. The 1983 unveiling of The Virtuoso, a 36-foot concrete sculpture in downtown Houston, represented a major shift in artistic endeavors. While continuing to paint on a limited basis, Adickes turned his attention to large outdoor sculpture. The one he chose for his home town, as a tribute to the 200th anniversary of the birth of Sam Houston, is seen by thousands as they travel Interstate 45 on the southern edge of Huntsville. In 1989 Adickes began work on The Winds of Change--an eight-foot bronze of George Bush. Originally unveiled at the 1992 Republican Convention in Houston, the statue was presented to Houston's Intercontinental Airport when the facility was officially renamed for the former president. 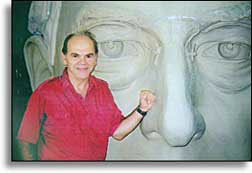 Adickes's latest project is as incredible as the story of his personal growth as an artist--colossal-sized busts (8 to 12 feet tall) of all 41 presidents, which will make up a walk-through theme park in Williamsburg, Va.
Adickes calls it a "Mt. Rushmore on the ground." One bust, that of Andrew Jackson, is on display just outside the Museum of Art in Jackson, Miss. Tommy R. Austin was the U. S. Customs Service agent responsible for the investigation of the illegal exportation of American industrial high technology, weapons of war, nuclear weapons, nuclear devices, and enforcing the Trading with the Enemy Act from 1994 to 1997. Before that he posed as a drug smuggler, drug dealer, importer, financier and other persons involved in international organized criminal narcotics smuggling and money laundering organizations. Even before that he was a patrol officer on the waterfront in Houston and numerous areas of the Texas/Mexico border, and served as a "sky marshal" preventing the hijacking of United States flagship aircraft by terrorists. When Tommy Austin graduated from Sam Houston State University in 1975 with a bachelor of science in law enforcement/police science, he might have anticipated at least some of the dangerous and exciting assignments he has faced. What he did not anticipate, however, was meeting a four-year-old boy named Christopher Greicius in Phoenix, Ariz., in 1977, and what would happen as a result of that meeting. Chris Greicius was suffering from cancer and his greatest wish was to be a police officer. After Austin and his law enforcement friends gave Chris helicopter and police cruiser rides, a badge, and his own uniform, complete with police helmet and goggles, the Greicius Make-A-Wish Foundation was born. The Make-A-Wish Foundation has grown to hundreds of chapters and divisions throughout the United States and the world, with thousands of volunteers and millions of dollars raised to grant the wishes of more than 50,000 children with life-threatening diseases. Austin, now retired from the Customs Service and living in Spring, has earned his Masters of Social Work from the University of Houston. With the awards, memberships, and involvements he has amassed in his law enforcement and volunteer agency career, he expects little idle time during his retirement. He received the United States Department of the Treasury Albert Gallatin Award this year, along with being named an outstanding alumnus of SHSU's College of Criminal Justice. In 1996 he was presented the SAVVY Award as Houston's Volunteer of the Year, and was the first recipient of the "Austin Award" as the U. S. Customs Service's Humanitarian of the Year in 1989. He has also been presented Commissioner of the U. S. Customs Service Awards three times, numerous in-service awards from the Customs Service, the National Child Labor Committee's Louis Hine Award, and the Jaycees Spoke Award. Austin and his wife, Kay, have five children and four grandchildren. In 1963, Karoline (Karey) Patterson had just finished her journalism degree at Sam Houston State and was working as an editorial assistant for the Texas Medical Association. Soon to wed Maurice Bresenhan, she attended a quilting bee with relatives and friends who were making her a wedding quilt. She later worked for the Huntsville school district, for the Texas Classroom Teachers Association, received a master's degree in journalism from the University of Texas, and worked as editor of several publications. From 1970-74 she worked for Ruder & Finn Public Relations, and was named the company's vice-president, becoming the first woman from a regional office to hold that position. She won a primary election for the Texas House of Representatives, but lost the general election. In 1974, more than 10 years after getting hooked on quilting, she opened the Great Expectations Quilt Shop in Houston, which has grown to one of the largest quilt shops in the world. She has increased her involvement in the $1.5 billion quilting industry as president of Quilts, inc., director of the International Quilt Market, International Quilt Festival, European Quilt Market, Quilt Expo, A Victorian Romance and Embellishment. In 1997, The Houston Business Journal named Quilts, Inc. as one of the city's "Top 50 Women-Owned Businesses." Her leadership in and promotion of quilting has not gone unnoticed among quilters. She is a co-founder of the International Quilt Association, founding director of The Alliance for American Quilts, a co-founder of the Quilt Guild of Greater Houston, and a founder of the Texas Quilt Association. The Quilters Hall of Fame inducted her into its prestigious honor roll in 1995. 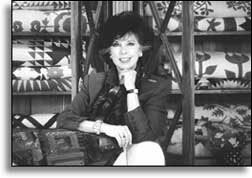 She has also received the San Antonio Conservation Award and the Round Top Award "in recognition of leadership in reviving and sustaining interest in the American art of quilting." Using the communication skills she began developing at Sam Houston State, she has written several quilting-related books and publishes more than 100 informational/promotional publications each year. Ms. Bresenhan is a fifth generation Texas quilter and an acknowledged expert on quilt dating. She has served as a quilt appraiser and quilt contest judge. She is a director of the Texas Quilt Project to document the state's quilt heritage and was one of the organizers and sole quilt documentor for the Texas Quilt Search. Her personal quilt collection includes family quilts, rare antique quilts, and quilts made especially for her. In addition, her company has a fine corporate quilt collection that is open for tours monthly by advance reservation. Major General Claude W. Reinke retired this year after 32 years of service in the U. S. Marine Crops, during which he showed impressive leadership skills in many varied assignments throughout the world--leadership skills developed on the playing fields and in the classrooms of Sam Houston State University. A native of Bay City and graduate of Bay City High School, he attended Sam Houston State from 1961 to 1965, graduating with a bachelor of science degree. Following graduation he remained for an additional year as a graduate fellow. While attending Sam Houston State on an athletic scholarship, he lettered four years in football. He was named an All-Texas and All Lone Star Conference player in 1963 and 1964. His off-field leadership included service as president of the T-Club Lettermen Association and member of Alpha Tau Omega fraternity. Upon graduation, Reinke was commissioned a second lieutenant in the Marine Corps. In addition to service as a company commander in Vietnam and in Okinawa, Japan, he has had a number of domestic assignments. He has been an infantry tactics instructor, an associate professor with the Naval R. O. T. C. unit at the University of Minnesota, and deputy director of the Marine Corps Institute in Washington. He served three years as assistant Naval attaché in Athens, Greece and two years as the ceremonial parade commander at Marine Barracks in Washington. He has been a political-military plans officer at the headquarters of the Marine Corps in Washington and operations officer for the First Marine Division in California. He has also held the positions of battalion commander, commanding officer of Officer Candidate School, and chief of staff for the 3d Marine Division. As a general officer he has served as the commanding general of Camp Butler in Japan, as the facilities director of Marine Headquarters in Washington, and commanding general of Camp Pendleton in California. During his career he was a distinguished graduate of the Marine Corps' Amphibious Warfare School and the Command and Staff College in Quantico, Virginia. He also graduated from the Foreign Service Institute in Washington and was a senior fellow at the National War College. He has been awarded the Distinguished Service Medal, Legion of Merit, Bronze Star Medal with Combat "V", Meritorious Service Medal, Combat Action Ribbon and numerous unit citations. He is married to the former Abby Holley of LaCrosse, Wisc. They have five children: Kathryn, Kari, Kelli, Kati and Christopher. Following his retirement this year he assumed the position of publisher of The Californian, a daily newspaper in Riverside County in Southern California.